February 7, 2013 - This morning a meeting between Iberia management and the six of its unions representing employee groups failed to reach any agreement of the company’s transformation plan. The meeting took place after the union had rejected Iberia’s latest proposal, which complied with all the terms agreed in the meeting with unions on December 17. The new offer represented a 30 % decrease in the staff reduction initially proposed by management, a smaller pay cuts and called for no layoffs at all, but only early retirements. The unions’ rejection of the offer and announcement of an initial 15-day strike to be followed by others, actions which the union themselves described as “uncontrollable”, were disproportionate and a threat that is intolerable to the company. Iberia reported that at a time of weakness for Iberia, this announcement of such a disproportionate action only aggravates an already difficult situation. The company will use all legal means at its disposal to make the adjustments needed to restore it to profitability, and to have a future.” Iberia Airlines is the flag carrier airline of Spain. Based in Madrid, it operates an international network of services from its main bases of Madrid-Barajas Airport and Barcelona El Prat Airport. 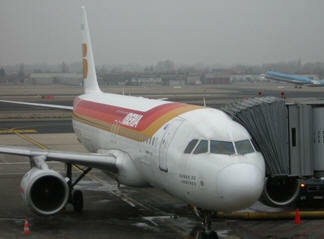 Iberia, with Iberia Regional (operated by an independent carrier Air Nostrum), is a part of Iberia Group. In addition to transporting passengers and freight, Iberia Group carries out related activities, such as aircraft maintenance, handling in airports, IT systems and in-flight catering. Iberia Group airlines fly to over 102 destinations in 39 countries. Via code-sharing arrangements with other companies, it offers flights to another 90 destinations. On April 8, 2010, British Airways and Iberia had signed an agreement to merge, making the combined operation the third largest commercial airline in the world by revenue. Shareholders of both carriers approved the deal on November 29, 2010. The newly merged company, known as International Airlines Group IAG, was established in January 2011, although both airlines continue to operate under their current brands. In November 2012 Iberia reported it was planning to reduce the number of employees by 4,500 and its fleet by five long-haul and 20 short-haul aircraft, in a "fight for survival", as IAG's chief executive officer said.